The gnocchi came out like little clouds. The recipe is from Biba's Italian Kitchen. My Mom gave me the book back in 1995. We both loved watching Biba on television. The Gnocchi recipe is easy! I baked the potatoes this morning. I got home from errands at 2:45. I made the Gnocchi and was able to get to 4:30 mass. Not bad! 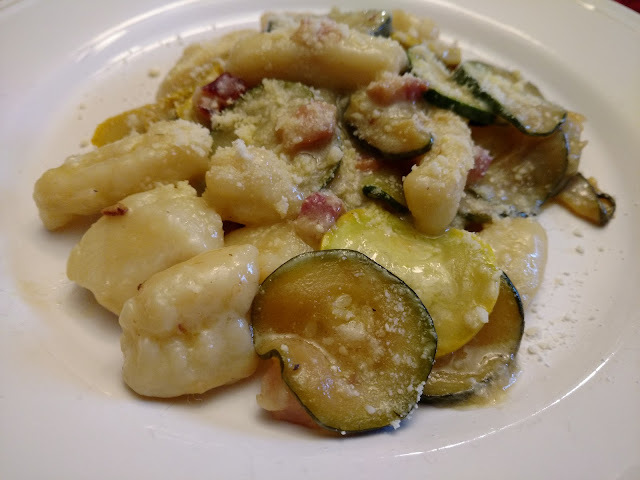 The Gnocchi recipe is at the end of this post. The sauce took 20 minutes to put together. First I heated olive oil in a saute pan. I browned the diced pancetta. Next, I added 2 sliced zucchini and 1 sliced yellow squash. I sauteed them until they started to break down. I seasoned the pan with salt, pepper, and crushed red pepper. I added a knob of butter and some white wine, maybe about a 1/2 cup. Meanwhile, I boiled a pan of water and added the Gnocchi. When they rose to the top of the pan I used a slotted spoon to remove the Gnocchi from the water and place them in the saute pan. After adding the Gnocchi I added some of the pasta water to make a sauce. Over low heat, I stirred everything together and added more water as needed. I finished the sauce with some Parmesan Cheese. Preheat oven to 375 degrees. Wash and dry the potatoes. With a knife, make a long, deep incision in the potatoes. Put the potatoes in the oven and bake until they are tender, about 1 hour. When cool enough to handle, peel potatoes and put them through a potato ricer or mash them with a fork. Put potatoes into a large bowl and season with salt. Add the egg and 1 1/2 cups of flour. Mix the potatoes, egg and the flour together with your hands until the dough begins to stick together. Transfer the mixture to a wooden board and knead lightly, gradually adding the remaining flour if the dough sticks heavily to the board and to your hands. Knead the dough for 3 to 4 minutes until it is smooth and pliable and just a bit sticky. Divide the dough into several equal pieces. Flour your hands lightly, using both hands, roll out each piece of dough with a light back and forth motion into a roll about the thickness of your index finger. Cut each roll into 1-inch pieces. Hold fork with its tines against a work board, the curved part of the fork facing away from you. Starting from the curved outside bottom of the fork, press each piece of dough with your index finger firmly upward along the length of the tines. Let the gnocchi fall back onto the work surface. 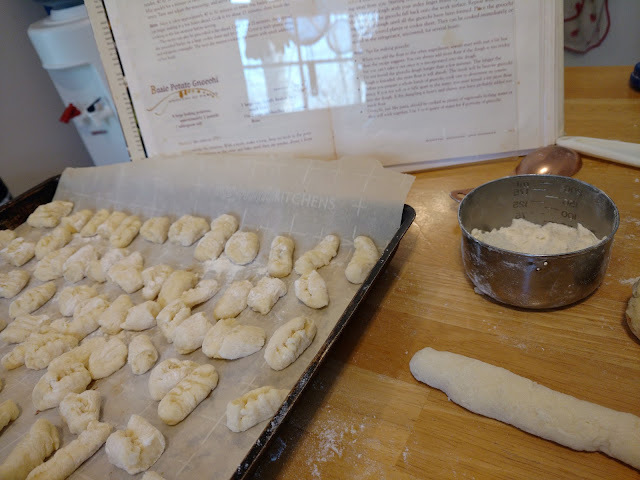 Repeat with remaining pieces of dough until all the gnocchi have been formed. 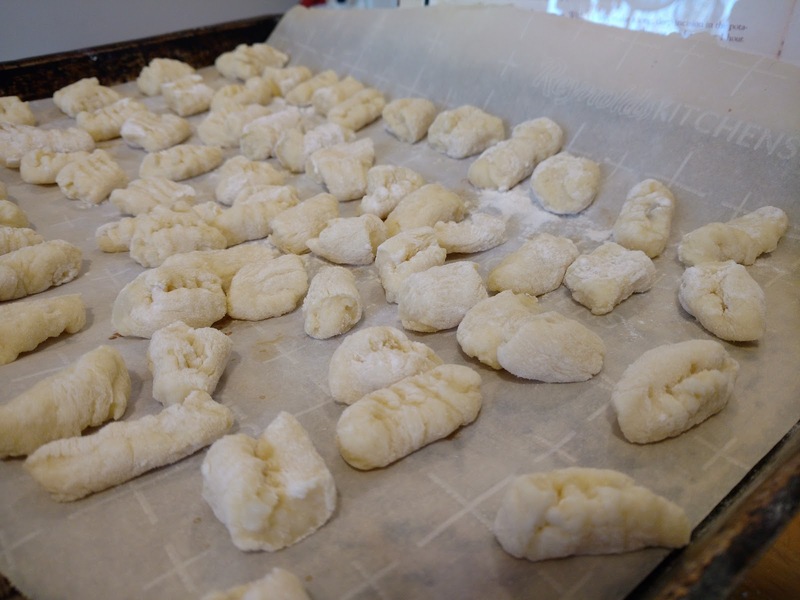 Place the gnocchi on a lightly floured platter or cookie sheet. they can be cooked immediately or stored in the refrigerator, uncovered, for several hours.